Our family dental services include cosmetic dentistry! Cosmetic Dentistry is one of Dr. Junco’s favorite things to do. If you are unhappy with your smile, you want someone who will be a good listener and who will be able to translate what you want into the restorations in your mouth — for the perfectly crafted smile! When a patient approaches us with the desire to improve the appearance of their smile, we start by asking a number of questions about what they would like to change. Are you troubled by chips? Misalignments? Discolorations? Gaps between your teeth? Whether you are looking to improve the appearance of your smile with simple treatment options, such as professional teeth whitening or you want to make dramatic changes with veneers, at Charlotte Progressive Dentistry, we offer the full spectrum of cosmetic dentistry options. Many dentists can offer cosmetic treatments. You will want someone who has a good eye and understands things like symmetry and proportions, but also who listens to your idea of beauty. We are proud to take our time and involve you in the smile makeover process. Take a look at the cosmetic services we offer in our office. Feel free to click on the link and read more! Chances are good that if you want to change the appearance of your smile, you already have an idea of what your new smile should look like. We will begin each cosmetic dental case with a consultation so that we fully understand your goals. Next, you will have a thorough dental evaluation with one of our highly skilled and experienced dentists. Both Dr. Greg Camp and Dr. Susana Junco have the training, experience, and artistic skill required to give you the smile of your dreams. Having healthy gums is essential to the success and longevity of your cosmetic dentistry. We will evaluate your teeth and gums and make any recommendations necessary to ensure the best outcome. At Charlotte Progressive Dentistry, we’re proud to be a Top Rated Local® dental office in the Charlotte, North Carolina, area. We offer a full line of cosmetic dental treatment options that will give you the healthy and beautiful smile you’ve always dreamed of. Whether you’re looking for a whiter, more confident smile, or you need general dentistry services like root canal therapy, dentures, or mouthguards, we’re happy to help. As we age, teeth stain from foods, beverages, and tobacco use. 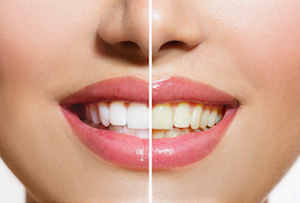 With KöR Professional teeth whitening, you can expect to see an improvement of eight to 10 shades. KöR has the lowest risk of sensitivity and is a permanent way to improve the beauty of your smile. Professional teeth whitening is a miracle solution for stubborn teeth stains, especially for people with permanent teeth. Those with sensitive teeth or receding gum lines may not be ideal candidates for this cosmetic dentistry procedure, however. Most teeth whitening procedures can take anywhere between 60 to 90 minutes (depending on the treatment and severity of the stains), making it an easy way to boost your confidence before a big work meeting or dinner date. Once your teeth whitening procedure is complete, your dentist may advise you to avoid drinking wine or eating certain foods that contain a high level of pigment. This should only last for about 24 hours. If you have small flaws in your smile that you would like to repair, cosmetic dental bonding can provide an affordable and non-invasive alternative. From chips to gaps to even misshapen teeth, cosmetic dental bonding adds composite material to your existing tooth structure to repair and conceal flaws. During the tooth bonding process, a tooth-colored composite resin is attached (or bonded) to a decayed, chipped, or discolored tooth. A very popular cosmetic dental procedure, the resin used in bonding can be shaped and colored to match the appearance of your surrounding teeth. When you visit Charlotte Progressive Dentistry for a dental bonding appointment, your dentist will select a color resin that matches the color of your natural teeth. Once a color is chosen, your dental professional will lightly etch the surface of your tooth before coating it with a conditioning liquid that helps adhere the bonding material. Your dentist will then apply the tooth-colored resin to your tooth, molding and shaping it appropriately. The resin material is then hardened through the use of an ultraviolet light. A dental crown, also called a cap, is a fixed prosthetic object that can be cemented to a tooth. Many people get crowns to cover up a damaged tooth as it can strengthen and improve the overall appearance your smile. We create custom crowns to match your natural teeth so that your smile appears seamless and your dentistry is not noticeable. Porcelain crowns protect your tooth structure after a tooth breaks from trauma or deep decay. Porcelain veneers are thin shell-like restorations that fit over your tooth structure. They can completely change the appearance of your smile and give you a whole new look. Veneers are ideal for patients who have worn, chipped, stained, or misaligned teeth. Whether you suffer from worn enamel, cracks, or chips in your teeth, veneers may be a great cosmetic dental solution for you. At Charlotte Progressive Dentistry in Charlotte, North Carolina, we specialize in the application of porcelain veneers at our dental office. These veneers cover the front surface of one or more teeth with a thin shell of porcelain material. As a less intrusive option than crowns or braces, veneers can enhance the brightness of your teeth and can assist in the straightening of your smile. Porcelain veneers are a favorite among our dental patients because they can last between 10 and 20 years. If your dentures do not make you feel confident and attractive, we can help. When we design your dentures, we will discuss how you would like your smile to look. You don’t have to give up your idea of a beautiful, comfortable smile just because you have missing teeth. Today’s dentures are more natural looking than ever. Dentures are a great option for people with missing or damaged teeth. These artificial teeth are crafted by your dentist, and they can either be full or partial. This means that they can be used to replace all of your teeth or just some of your teeth. These days dentures are made out of porcelain, plastic, and resin materials. Dentures can not only help you improve the appearance of your smile, but they can also keep the structure of your mouth sound. They make it possible to eat foods that require a good amount of chewing, so you can maintain a health diet. Contact us today to schedule a cosmetic consultation and take the first step to having the smile you have always wanted. In addition to our cosmetic dentistry services, we specialize in a variety of general dentistry services including tooth extractions, composite white fillings, sleep apnea solutions, snoring prevention, and comprehensive periodontal treatment.